With just 25 days until the end of 2016, we invite you to join the growing number of committed Philadelphians who are making the Viaduct Rail Park a reality. Join the crowd-funding effort today! Nearly 50 people have already made donations through the site and you can help more than double that number. If you want to create a truly unique new open space and value the growing vitality of Philadelphia, please make a donation and spread the word about this transformative new park. Visit FundtheRailPark.org today to donate, create your own fundraising page, and challenge your friends and coworkers to get involved. Donating only takes a moment – but will pay dividends to our city forever! 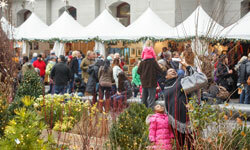 While there's still time left this Holiday season, visit the Made in Philadelphia Holiday Market in Dilworth Park! There are plenty of great gifts from local artists, crafters, confectionaries and designers for everyone on your list. The market will be open every single day through Christmas Eve. 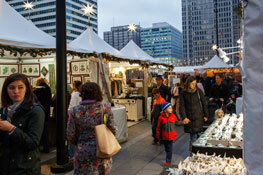 For a complete schedule and list of vendors, visit DilworthPark.org/madeinphiladelphia. The Rothman Institute Rink is open at Dilworth Park! The Rothman Rink is an unparalleled entertainment experience on Philadelphia's center stage in a wonderfully unique urban setting. Open daily through February 26, 2017, admission is $3 for children ages 10 and under and $5 for adults. Skate rental is $10. Plus, the Rothman Cabin is steps away from the rink with tasty food and drink from the Air Grille. 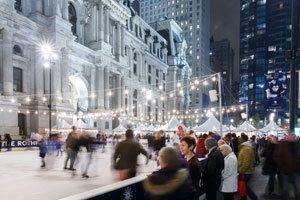 For special holiday hours, events, rental information, and more, visit DilworthPark.org. This season is presented by Rothman Institute with support from Subaru, Capital One, The Philadelphia Orchestra, Temple University and 6abc. Get closer to dinosaurs than ever before in Jurassic World: The Exhibition at The Franklin Institute! Based on one of the biggest blockbusters in cinema history, the Exhibition immerses audiences of all ages in scenes inspired by the beloved films. 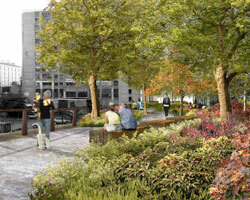 Now, the park that was only a promise comes to life right on the Parkway. Travel to Isla Nublar as a VIP guest and explore Jurassic World. Stare in wonder at a towering Brachiosaurus; come face-to-face with a Velociraptor; and get a rare up-close look at the most vicious dinosaur of them all, Tyrannosaurus Rex. The exhibit runs through April 23, 2017. The Philly PHLASH holiday season daily service continues through December 31, providing service to 22 stops located near holiday attractions and shopping districts throughout the downtown. New this year is the RidePhillyPHLASH.com mobile site that allows you to track PHLASH as it arrives, along with information about nearby attractions. Latkepalooza is an event that Philadelphians citywide look forward to perennially. Nine restaurants from across the city will prepare and serve more than 3,500 latkes over the course of two hours on December 18 at 2pm in the Gershman Y’s Levitt Auditorium. Adding to the festive atmosphere is kids band The Plants, a much-loved Philadelphia-area four-piece that mixes funk, folk, Motown, rock and more for a truly great musical experience. General Admission for adults is $20 and nets you 10 latkes to taste; 2- to 12-year-olds are in for $15 and get seven latkes; and under 2-year-olds are free and enjoy three latkes. To purchase tickets, visit the Gershman Y, call 215.545.4400, or visit GershmanY.org. The Reading Terminal Holiday Railroad steams into the Market every day this holiday season, through December 31. This magical interactive model railroad display, featuring 17 trains on a 1/3 of a mile of track, will delight children of all ages (including adults who are children at heart). Make the Reading Terminal Holiday Railroad a part of your holiday traditions this year! Access to the display is free of charge and it starts running at 10am. Dilworth Park Café and Air Grille now have a rewards program! Earn a point for every dollar you spend at either location. When you reach 50 points you will receive $7 to spend at your next visit! These Dilworth Perks can be earned and redeemed at both Dilworth Park Café and the Air Grille in the Rothman Cabin. That means you have more options! Plus, E-Gift Cards are now available at both locations - ‘tis the season for sharing! Give the gift of a delicious lunch in Center City or cozy drinks in the Rothman Cabin. Visit the café's Facebook page and click on the gift card tab to purchase a e-gift card today. New to Dilworth Park this winter is a holiday-inspired Garden that was created in partnership with Greater Philadelphia Gardens. Located on the Greenfield Lawn, children and adults will delight in discovering picture-perfect moments amid the vibrant plantings, topiaries, twinkling lights, and décor that showcases all 32 public gardens, arboreta, and historic landscapes that are located within 30 miles of Philadelphia. Anchoring the center of the maze is a welcoming gazebo.